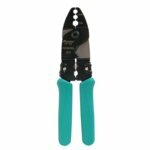 Coax connectors crimping tool for crimping RG: 55, 58, 59, 5, 6, 21, 141, 142, 143, 210, 212, 222, 223, 303, 304, 400, Belden: 8279, 8281, 9231, 9141. 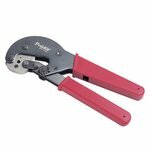 Copper clad steel coaxial cable crimper for oval/hex F connectors RG6, RG59 (used in CATV, home theaters, satellites and security systems). 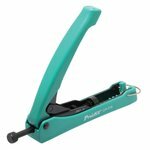 Cutting, Stripping, Crimping functions. 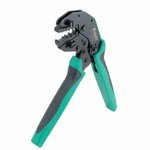 Coax connectors crimping tool for crimping RG: 58, 59, 62. 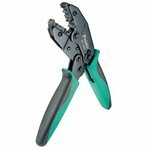 Crimping tool for waterproof connectors RG-58, RG-59 and RG-6 (F, BNC, RCA). 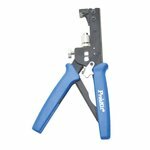 Special tool designed for crimping F, BNC, RCA, IEC, MINI F connectors on RG-58, RG-59 and RG-6 coaxial cables.